During the 1960s, Anna Boghiguian (b. 1946, Cairo, Egypt) studied political science at the American University in Cairo then studied music in Montreal. When realized she was losing her hearing that limited the prospect of pursuing music, Anna Boghiguian found freedom of expression in making visual art. Like with music, visual art can express ideas and sentiments that surpass the use of verbal language. But more importantly, she liked that visual executions could elude from censorship. 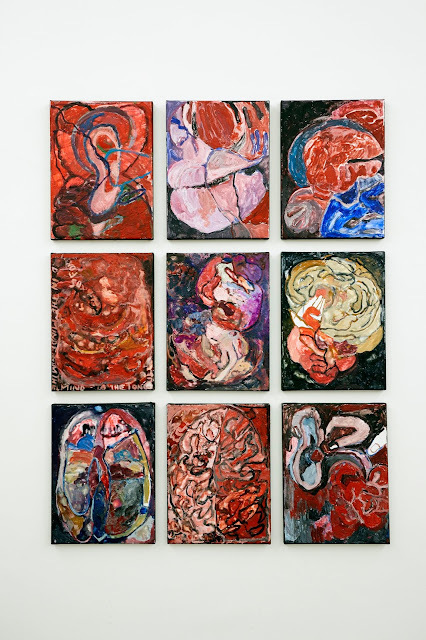 With sincerity and rawness, Anna Boghiguian's work deals with histories of wars, revolutions, and a global economy propelled by the seduction of greed and power. Currently on view until August 19th, the New Museum presents the Armenian-Egyptian artist's first solo exhibition in its South Gallery. There are 18 works produced from 2016-17 with the exception of Guilt Machine, a mixed mediums sculpture which was made in 2013. 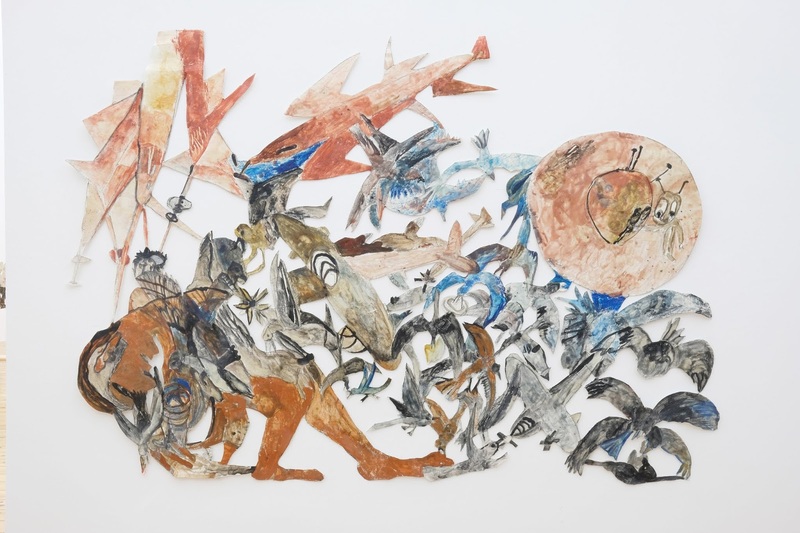 In the series of works titled Woven Winds: The making of an economy - costly commodities (2016), Anna Boghiguian produced cutouts to narrate historical events such as the 1845 Great Famine in Ireland and the cotton trade in 19th century US. 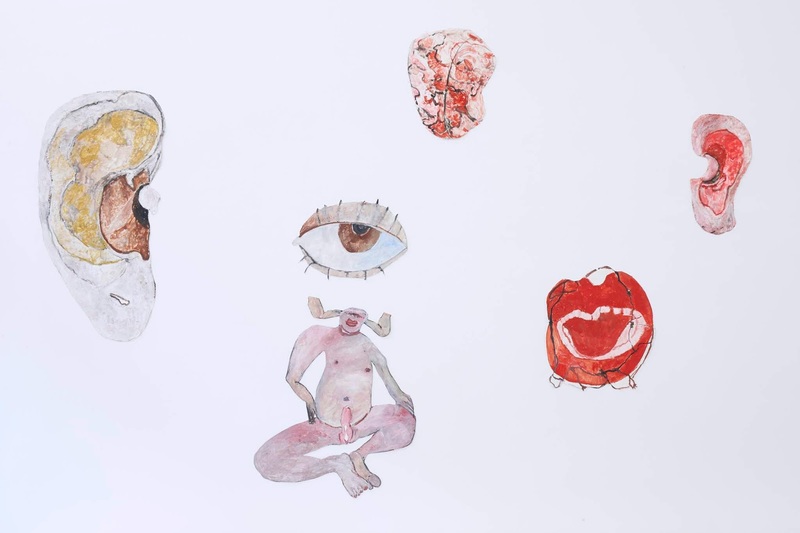 In turn, her narrative histories convey a strong message protesting against the abuse of power and the use of human beings as a form commodity. "1845 Great Famine" depicts a flock of immigrates leaving Ireland and sailing across the Atlantic due to the country's sudden shortage of staple food and the parliament-imposed law restricting foreign potato importation that further aggravated the situation. Anna Bothoguian penciled in words such as "Potato Famine 1845, Ireland" and on the sail-ship she made a line indicating it going across the Atlantic into the US carrying Irish immigrants. Without being overtly literal, the piece leaves much of the information implied. What this does is that the work arouses curiosity and requires the viewers to understand the full politic implications of the event. At the same time, the artist presents a theater of the absurd with crudely drawn and cut out figures arranged like shadow puppets. Another part of Woven Winds: The making of an economy- costly commodities (2016) presents the history of cotton trading that led to slavery and civil war in the 19th century US. While the piece brings to light racial injustice and the turning of black humans into a form of commodity driven by the seduction of profit and greed, it is also a narrative recounted with as much poetic gesture as the subject allows. The drawings are figurative but not true to life, the colors are vibrant but without lurid contrast to suggest violence and death. Rather, her color scheme resembles illustrations in children's story books, leaving the moral of the tale open. It is this odd combination of subtle poetry and gruesome facts of history that makes Anna Boghiguian's work fascinating if not intimidating. This statement relates her's fascination with senory organs and how they allow us adapt to society. Echoing the artist's own experience of losing her hearing (as she told the audience during a conversation with Hans Ulrich Obrist hosted by Castello di Rioli Museo d'Arte Contemporanea in 2017), Brains I and Brains II both made in same year, show her process of seeking correlation between the ear (hearing) and the brain (thinking). In these drawings, the artist's intertwining lines wrapping around soft shapes that resemble flesh and body parts like wires in a machine. They present a struggle between what is heard by the ear and the information processed by the brain. As the lines represent small veins and passages of knowledge they overlap and extend, the message reads as ambiguous and arbitrary as the words being spoken. Anna Boghiguian once said that she was more interested in the meeting of minds than the actual meeting of the person. 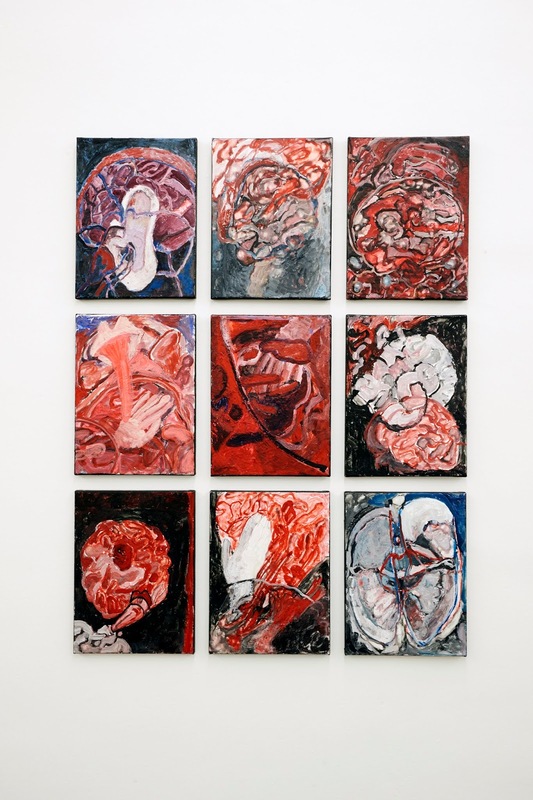 In many ways, her work is not easy and the crude and child-like markings are deceptively naïve. Her work requires keen observation and reflection only then, one meets the artist's mind and can truly appreciate. The historical references in the individual works are for viewers undeterred by the raw appearance of the images. From a life time (since 1970s) of traveling, artist Anna Boghiguian presents a view of the world through her lens and through allegorical tales that remind us to be wary of the seduction of greed and power. "The History of Loom" is on view at the New Museum until August 19th.